I'm behind in my VeganMofo blogging as we were out of town for a few days, and I was trying to spend more time away from the computer than in front of it. (The unreliable WiFi at our hotel helped in that regard.) This post will deviate from my SOS-free theme to talk about the food boyziggy and I had in the very vegan-friendly city of Seattle. 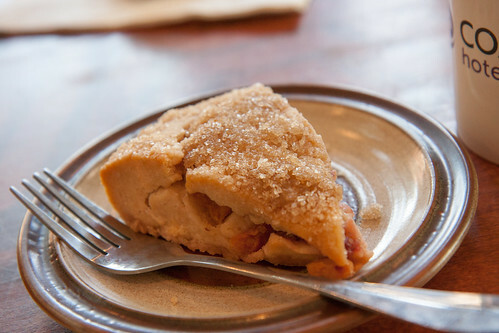 I'd already visited Seattle several times, so knew that there were numerous vegan-friendly restaurants. What I hadn't realized is how many 100% vegan restaurants the city now featured. 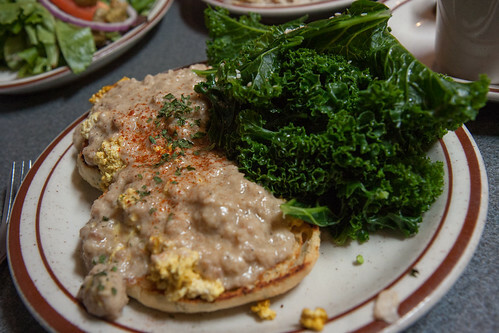 We went to five vegan restaurants and a vegan grocery store, and there are even more vegan restaurants that we didn't visit on this trip. First up, though, was a vegetarian (not vegan) restaurant that I've been to on every trip to Seattle, with and without Ziggy: Cyber-Dogs. This tiny Internet cafe has veggie dogs (all can be made vegan) and lots of vintage posters and kitsch. I had a chili dog, which ended up being too spicy for me. But it was still fun, and I enjoyed beating Ziggy at the tabletop Ms. Pac-Man. The next day we went to Wayward Vegan Cafe, which a local resident had noted was not only all vegan but vegan-operated as well. (We got into a lengthy discussion about this on Facebook, as he insisted a vegan restaurant should only hire vegans. Ziggy and I, and others, strongly disagreed.) The food was excellent; I had the biscuits and gravy, pictured above. This café appeared to be in a vegan-centric part of the city (University district), as just across the street was another vegan restaurant, Pizza Pi, and a vegan grocery store, Vegan Haven. If I'd known about the latter, I would have stocked up on groceries there instead of Whole Foods for sure. We still bought a bunch of snacks and other things, including beeswax-free lip balm which I'd been looking for for awhile. 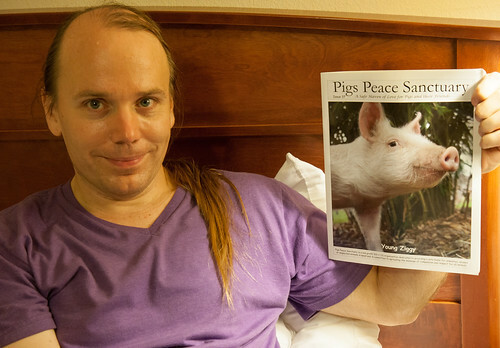 I also had to pick up a copy of this magazine (free) from the pig sanctuary that Vegan Haven benefits; the issue featured Ziggy's namesake on the cover. 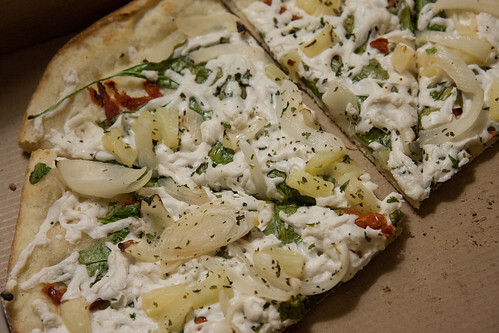 From Pizza Pi, we got vegan pizza for dinner, and had leftovers for lunch the following day. Another great place we visited was Black Coffee Vegan Co-op, which definitely seems oriented toward counter-culture and revolutionary types. Lots of books, board games, and zines. I got a strawberry-peach scone and a pumpkin spice chai. We also visited Plum Cafe, which was close walking distance from our hotel. I got a kale salad (which was large enough for two meals) and brownie, but didn't take a photo. We'd planned to go to the full-service restaurant, Plum Bistro, as well, but they didn't take reservations for two people and the waiting time on a Saturday night was too long. 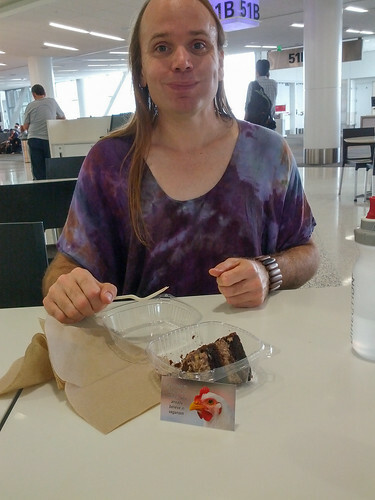 We went to Veggie Grill instead, where we also got take-out to eat at the airport on the way back. Finally, I took the opportunity to leave some business cards and bookmarks from The Abolitionist Vegan Society at several of the restaurants we visited, including the vegan-friendly Plant Café at SFO where we ate at the beginning and end of our trip. It was great to see all the vegan restaurants in Seattle. I hope we can have more of these, and even better, a vegan grocery store, in San Francisco. Good question! I went vegetarian my last year in college at Northwestern, and that was no problem, but I never tried to be vegan there.